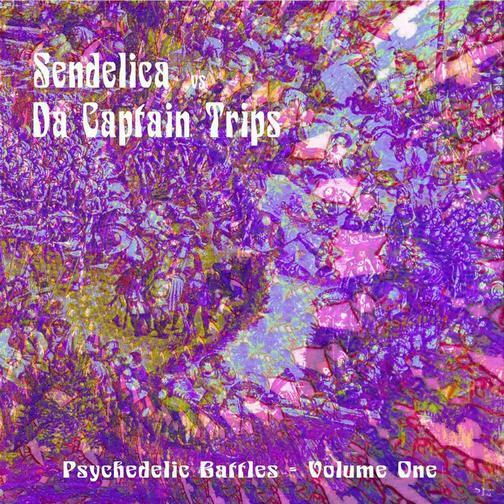 Here we’ve got a split album between Welsh Space/Psych rockers Sendelica and Italian psychsters Da Captain Trips. Sendelia’s side consists of Day Of The Locust, a 23 minute “Geoff Chase mix” of the track that originally appeared on the 2010 Streamedelica She Sighed As She Hit Rewind on the Dream Mangler Remote album. The first half of this epic jam consists of monster heavy spaced out hard Psych rock with a tightly wound bass and drums rhythmic pulse and killer left/right channel guitar action. The band are tight as a knot throughout and the energy and intensity never wane as bass and drums relentlessly propel the musical motion while the guitars solo in acidic space. Though not always prominent there are electronic embellishments, but Pete’s guitars seem to be handling the cosmic factor just fine. The second half is more of the same but becomes a brain searing shock of aggressively harsh acid-noise Space Rock. Wow, what a ride. This sucker will leave you head spinning and drained. Freakin’ awesome. Da Captain Trips’ three tracks are a considerably milder contrast to Sendelica’s sonic assault. The Repentant Blacksmith gets a steadily funky and slightly Bluesy Psych rock groove going with tasty soloing guitar, hypnotic synth waves and freaky electronic effects. Some of it brings to mind a more Space Rock version of Colour Haze. Horizon is a nicely melodic jam with Proggy keys that gets increasingly intense as it goes on. Ditto for Space Tide, a loose melodic jam that trips along, sometimes quietly and sometimes more heavily in Psychedelic space. The vinyl will be released in an edition of 300 by the Vincebus Eruptum label (and seems to be sold out already) and the CD in an edition of only 150 by FRG Records.